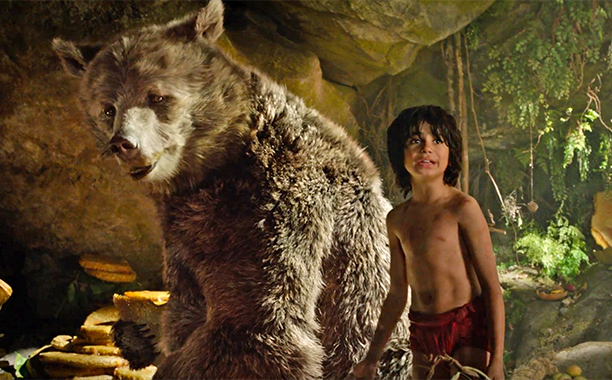 Jon Favreau's "Jungle Book" has a forest-full of expectations to live up to. 1967's wonderfully animated version with its beautiful colours and endearing characters lives on despite the decades, and subsequent re-makes including live-action ones, save for a unique "anime" version, have yet to match that level. However, if the ebullient audience reaction from NZ to India to the USA is anything to go by , Disney appears to have hit the ball out of the sylvan park this time. I heartily concur - having enjoyed an IMAX 3D version where the occasionally fuzzy images are amply atoned for by massive looming projections of characters foregrounded by this technology. That alone would not have amounted to a hill of beans , but amidst all that CGI magnificence, director Jon Favreau ensures strong heart-felt story-telling and memorable characters that redeem the heart of this beloved classic. The jungle (a word derived from Sanskrit) , ostensibly an Indian sub-tropical forest, dense and forbidding by natural design, which Kipling based his story in , is vividly brought to life. Fascinating big and small fauna have anthropomorphic personalities with voices perfectly suited to their physiognomy. 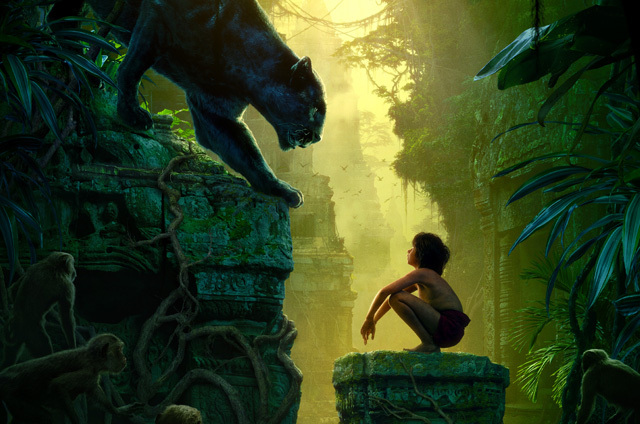 Mowgli - a "man-cub" - is left in the forest as a baby, brought up by wolves and hunted by a particularly villainous tiger Shere Khan who swears revenge after being scarred by a human in the past. Justin Marks' script retreads familiar territory, creates heartening new ground, and almost always entwines itself in interesting terrain. 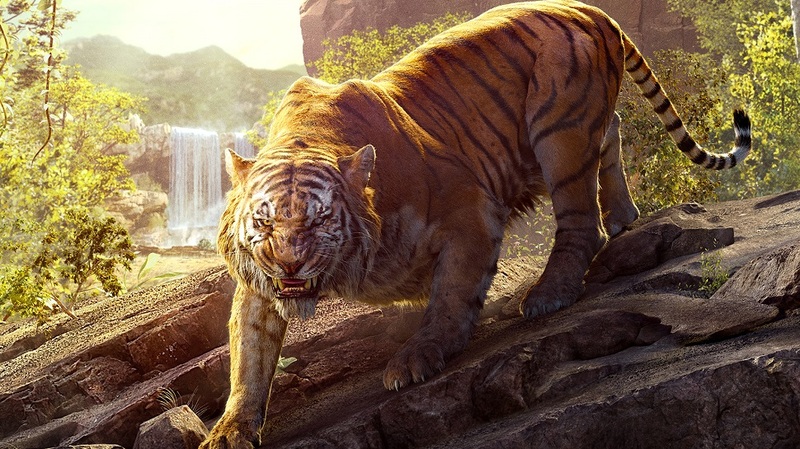 The honour of being the first CGI-perfect and roaringly formidable tiger, alas does not belong to Shere Khan - that award goes to the remarkable 'Richard Parker' from Martel and Lee's 'Life of Pi' - a movie that Disney executive Alan Horn and director Favreau were looking up to. 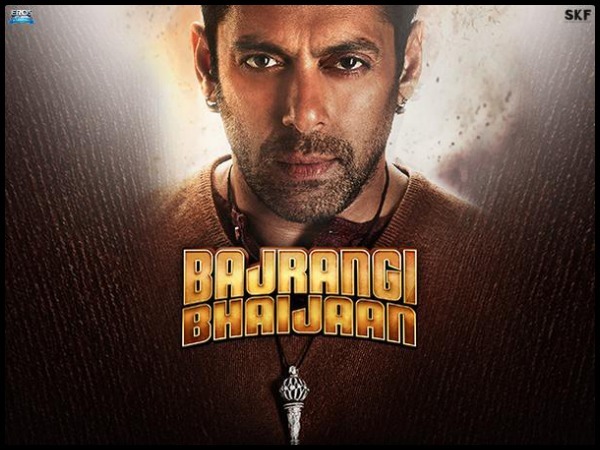 However, Shere Khan is an outstanding addition to this elite ilk - his body is dark and rather scrawny,but his face is a rotund inferno of ferocity, with any trace of prettiness obliterated by a burn scar (Indian secularists won't be too pleased by a villain carrying this Muslim name - this early example of manufactured Hindu-Muslim schism, and its beginning from Kipling's colonial era, is a provocative meta-analytic exploration that is outside the scope of this review). 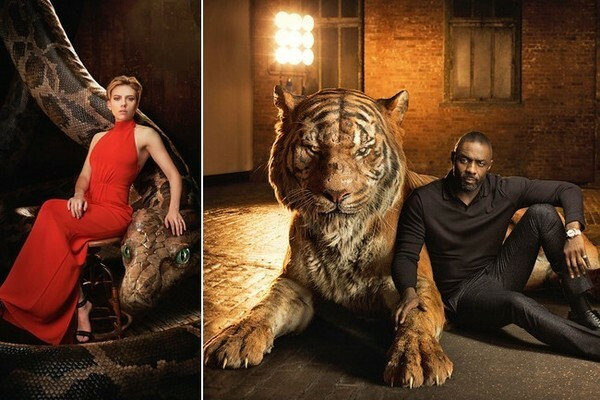 A deadly beast flawlessly voiced by Idris Elba, Shere Khan prowls invisible amidst tall grasses, playing with wolf cubs and sparing their body while subtly poisoning their minds, and lunging lightning-speed at another dangerous carnivore tossed high off a peak in such a chilling flash that there remains no doubt he will brutally kill in front of us again, no matter that this is a kiddie flick. The appeal of his personality is matched in different ways by other characters. Bagheera - the panther - is rendered with beautiful muscular bulk which belies a softness tempered with noble steel - he risks death often but never abandons Mowgli's guardianship. Baloo does not look as cute as in the '67's cartoon, but the script impressively segues this huge life-like bear from seeming opportunism to complete likeability. 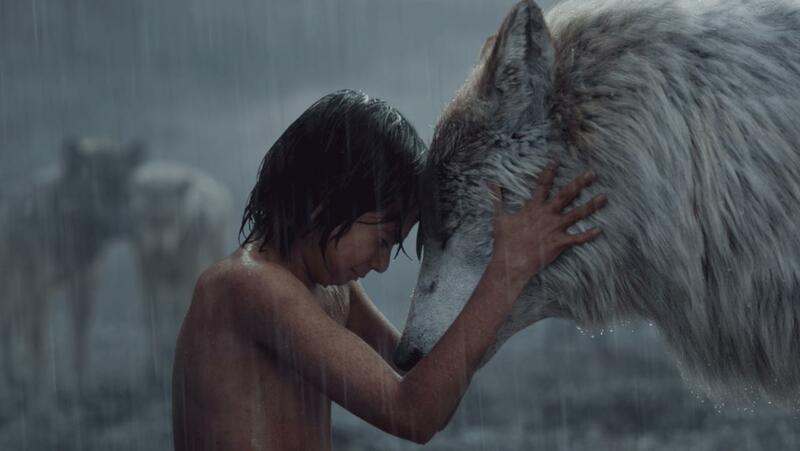 Raksha , the female wolf who rears Mowgli, is picturized in deeply moving shades of tenderness and courage. The adult next to me was startled out of his seat by a sonic boom accompanying a sudden tiger attack. It was my turn to react and whip my 3D-spectacled face away as a spinning stick hurtles down a cliff straight at us. Not all parts of story resonate - the sequence with a giant orangutan king and rambling stone ruins, is not as good as the nuttily groovy '60s version of jiving simians and shooting bananas. The runtime of 105 minutes, however, concludes just before ennui looms. Neel Sethi who embodies Mowgli, is undoubtedly endearing and consistently conveys gentleness and gumption, enhanced by a self-honed talent for mechanical engineering that his jungle pals see as "tricks". He's neatly made to look the part - with long hair, nice big eyes, flattened nose and a tiny vulnerable body all coveying an aww-so-cute appeal. Cribbing that I didn't see enough wit to perk up this little boy's portrayal, is unfair, isn't it? That he has a Yankee accent, shouldn't jarr too much considering that New York, from where Sethi hails , neighbours Vermont where the British Kipling birthed this Indian story. 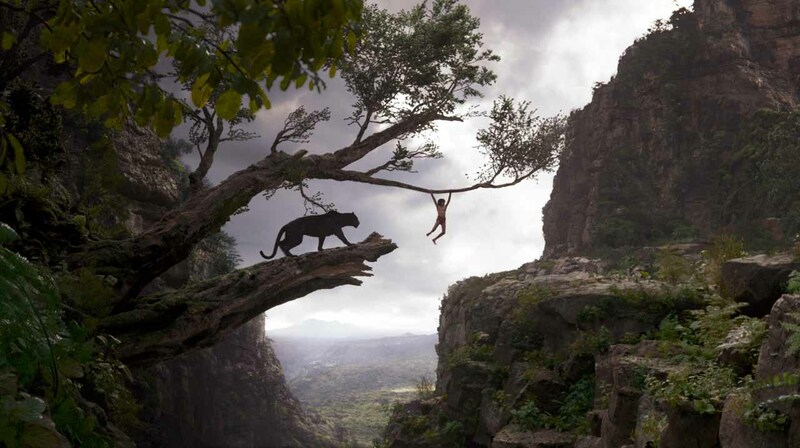 Jungle Book maintains its subtly eco-protective feeling beautifully at the end by marking a departure from endings of previous filmed versions. That it does not preach and yet manages to make us think, is another of its major strengths. As CGI advances by the day and offers us dazzling hyper-realism, we may never again see the big-time return of the fondly remembered animation canvases conjured up for good ol' Disney, but as long as there is sensitivity and craftsmanship such as that showcased by Favreau & Team, there is still reason to delight in what cartoons have become.